Pool Chemical Services | CleanShinePoolService.com Elk Grove CA. We at Clear Shine Pool Service in Sacramento believe that the chemical balance is the first key to having a beautiful pool. Part of keeping your swimming pool at the perfect chemical balance is to use the best tools for that. This is why use only the highest quality and most reliable testing methods, tools, and instruments. With our methods combined with operator knowledge and talent, our testing accuracy is unmatched! 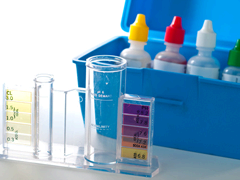 Swimming pool cleaning in Sacramento Chemical testing can be pretty simple, or quite involved, all depending on the balance of your pool. Our pool cleaner operators may perform several different tests depending on the condition of the pool or any special concerns he may have.